Like all things in life, we all love to have choices, right? One day I had a craving for colors, lots of them! So I took out my favorite medium- alcohol inks and started to play. I started out with a piece of vellum (40 lbs is a good heavy weight kind). I took out the ton Stamp and started with white embossing. As the stamp is so detailed, there is not an aweful lot you have to do. I applied the alcohol inks on the backside of the vellum piece and started coloring the flowers with an applicator. I am loving the result! There are always new kinds of coloring mediums--Zig Markers, Gelatos, Spectrum Aqua, Copics, Chameleon pens, Color Burst... Some will continue to stay and some will go. But alcohol inks are always my besties! Have you tried Craftsy classes? Here are some free classes to try out. If you love the format and structure of the classes, here are are few that are on sale right now. I would love to know how you did this. Do you do videos? Beautifully done Virginia, this is wonderful! hello there... love love love this card...:) you know which colors combine and you have a gorgeous way of incorporating them! 3 cheers... want to share a vid? yaaaaay:) dont let the meanies minimize your creativeness or your marvellous teaching skills:) ....but there is no obligation... could you do a video where only the people you allow cud watch the video? that way people would ask first and then only the ones "invited" cud watch?? bye bye 2 the old negative lovers huh? take care... and i am only one person and dont know nothing about how to do things in youtube... but i am an interested learner! ..and its such a HeLp to not have to pay subscription fees... i am in one of those circumstances with health that i could NoT afford....SwEEET... not asking 4 pity either.. i KnOw there are more people in my shoes that need you.. it all works yet, thanks to generous techniques thru awesome email subscribing! yay..
Just love this, V! You really made this shine! Whoa! Virginia, this looks AWESOME! I think this is beautiful, bold, and lovely!! I hope that you realize how cool this is and I love that you shared the idea with us!! I love using vellum and now I will have to try this method!! I think you are a beautiful lady and I hope you have a beautiful day!! This card is fabulous Virginia!! I LOVE the you used the alcohol inks on the back of the vellum. Do you know how many I have of these that are SO OLD and are sitting in my drawer. They scare me!! I LOVE when you used them because they inspire me. One of these days I will get them out and channel my "inner Virginia." Thanks for sharing!! ...and once again, she stuns us with a technique that produces another incredibly gorgeous card. What a stunner. You really do rock. Just love how you colored one flower, left others outline, and then blended part of the background - so gorgeous, Virginia!! Bright and beautiful, Virginia! You chose a perfect background stamp for the technique too! I scrolled down a bit to see what I missed, it's been a busy summer. Happy Anniversary to you and Dr. John. I can't wait to get a little time to watch your latest video! Gorgeous! 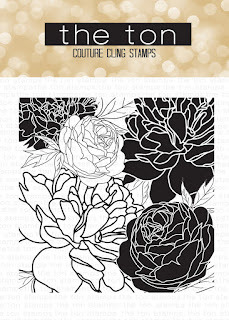 I so want this background stamp, it looks amazing with the alcohol inks! Just beautiful, Virginia! An amazing card. I just love visiting your blog. Fabulous, Virginia. Just love the colors, especially the purple!I have this background stamp and might just have to get my alcohol inks out. They are hiding in the basement. 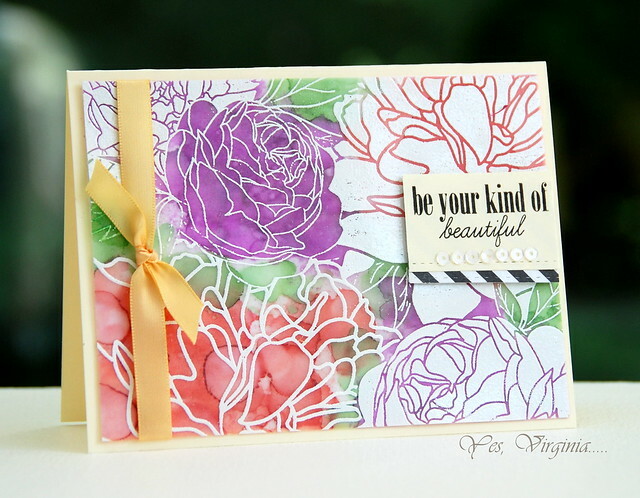 I love the way you colored this gorgeous BG stamp. I have it, but I can't figure out how you got the outlines of the non-colored flowers in colors! If you embossed the entire card in white, there is where I get stumped. 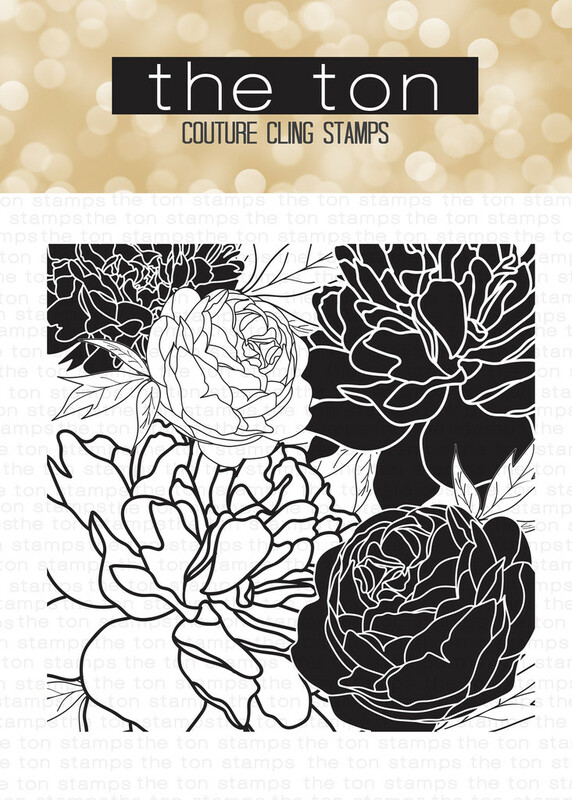 Did you heat emboss just the colored flowers and stamp the rest in the colors? I suppose this older post might not get an answer to me, but would surely appreciate one. I appreciate how busy you are. I so admire your art! You are one of my very favorite artists. Thank you.